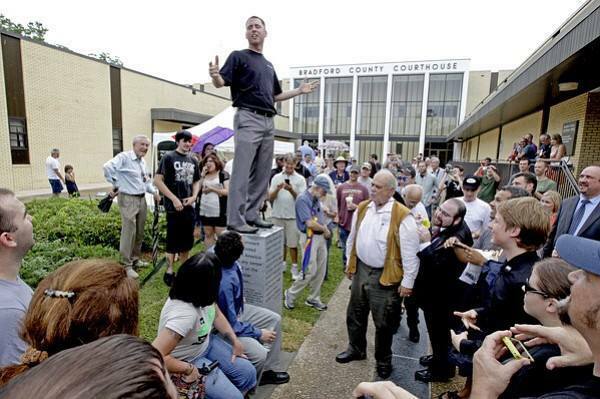 This is a picture of Eric Hovind, a brother in Christ standing atop a monument to Atheism at the Bradford County Courthouse in Starke Florida. This monument to Atheism was erected by the American Atheist and was dedicated on Saturday June 29th. During the unveiling ceremony Eric Hovind hopped atop the stone monument and began to publicly herald the gospel of Jesus Christ. Many of my brothers and sisters in Christ would then share this picture on their Facebook accounts, applauding Eric for preaching the gospel, and glorying in the Lord for the Spirit that gave him such courage to do so. I noticed something on the comment feeds however; there were those who claimed to be Christian, and yet revile at the fact that Eric climbed atop the monument and heralded the gospel before all those in attendance. The themes of those comments were this; “you show disrespect for the atheist by doing this, “Jesus wouldn’t do this, “actions are louder than words.” One woman said; “I don’t know what he is saying but it can’t be the gospel”. When I began to preach the gospel publicly the one thing I was most taken back by was professing Christians reviling at the gospel being preached. I was unprepared for this, and it came unexpectedly. When I began to preach the gospel publicly there were many things that caused me fear, but I didn’t fear being attacked by Christians, and yet I have found that often times that is who reviles most at the gospel being preached. It seems that no matter where a believer goes and declares the glory of The Lord, some religious person who claims the name of Christ says what you are doing is wrong. Yet Christ told us to preach the gospel to all creation. That means preach Christ anywhere and everywhere and at all times, to the glory of God the Father! The One who has been given all authority in heaven and on earth says to all those who now have peace with God. “Peace be with you; as the Father has sent me, even so I am sending you (John 20:21), to make disciples of all nations (Matthew 28:29), by preaching the gospel (Mark 16:15), that the Christ died for the sins of men, and was raised on the third day, and that there is forgiveness of sins for all who repent and believe (Luke 24;46-47), that Jesus is the Christ, the Son of the living God” (Matthew 16:16). He is sending us out to make disciples and His methodology for doing so is through the preaching of the gospel to all creation. The earth is the Lord’s, and all it contains, The world, and those who dwell in it.” (Psalm 24:1, 1 Corinthians 10:26) In another letter to the Corinthian church the apostle Paul called believers Ambassadors for Christ (2 Corinthians 5:20). I would have been reluctant to say this in the past, but I’m going to say it now. If you revile at the gospel being preached, no matter the person, and no matter the setting; there is very good reason to be concerned that you may not be a Christian at all, you have believed a different gospel. Do not be deceived...no revilers...will inherit the kingdom of God. (1 Corinthians 6:9-10) The gospel that I have found that most who claim the name of Christ yet revile at the gospel of Jesus Christ being preached is a humanistic gospel that puts man on a pedestal.